Scientists believe the Sun was formed about 4.5 billion years ago from clouds of dust and gas. Members of the Tsimshian tribe in the Northwest have told this legend about the Sun for many years. Long ago, there was no light. A few stars could be seen on clear days, but most of the time, the Earth was dark. Wise Raven was sad that the Earth was dark. He had made streams. He had put fish in the streams. He wanted light. A great chief in the sky kept the Sun in a box. Raven slipped through a hole in the sky. He saw the chief’s daughter approaching a spring for water. Raven turned himself into a tiny cedar seed floating on the water. The chief’s daughter didn’t notice the seed. She drank the cool, sweet water. The seed grew in her belly. It became a baby. The daughter gave birth to a baby boy. The baby grew into a happy toddler. The chief loved his grandson. He would do anything for him. The toddler asked for the yellow ball – the Sun – to play with. The chief gave the ball to his grandson. The child turned back into a bird. He flew into the sky and released the Sun. Then the whole world had light. A book all about Raven and the Sun. A storytelling video of a native American tale all about the Raven and the Sun. Question: Are legends about the Sun true? Answer: Legends about the Sun can’t be scientifically proven, but they often have great meaning for the people who tell them. Enjoyed the Easy Science for Kids Website all about Raven and the Sun info? Take the FREE & fun all about Raven and the Sun quiz and download FREE Raven and the Sun worksheet for kids. For lengthy info click here. Declan, Tobin. " 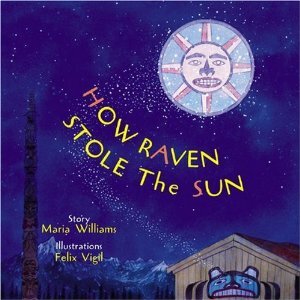 Raven and the Sun for Kids ." Easy Science for Kids, Apr 2019. Web. 21 Apr 2019. < https://easyscienceforkids.com/all-about-raven-and-the-sun-a-native-american-tale/ >.